Ugh, the Gregorian calendar is so boring. 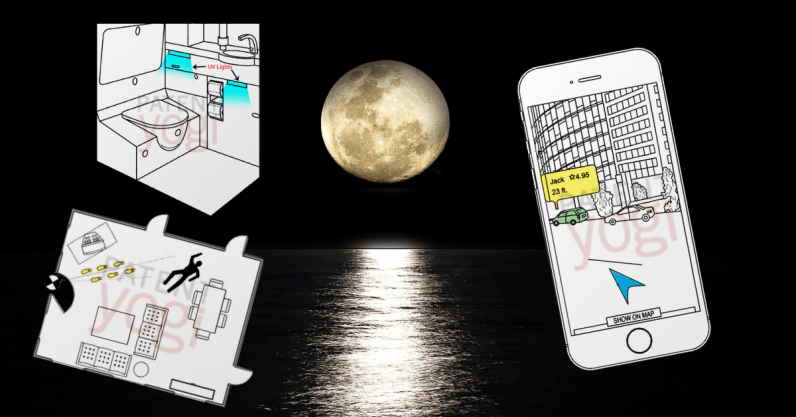 That’s why we’re disrupting monthly series with a lunar cycle-based series about the best patents of the last synodic month, picked by the PatentYogi team. Get ready when that moon gets gibbous, y’all. This March-ish roundup lands on the icky Worm Moon ! Since my last post, the US patent office issued over 13,028 patents and published over 13,113 patent applications. Each patent asset adds a little something new to the human knowledge base. As I cannot list all these patent assets here, the PatentYogi team has selected the five most interesting patent assets. Enjoy! A recent patent application from Microsoft reveals details of a “Sherlock Holmes” bot to perform automated crime scene analysis using machine learning. The figure above shows a complex crime scene where, to an untrained eye, the footprints and the body will be the only points of interest, when in fact, all the objects in the crime scene (e.g. furniture, TV, walls) will also play a role in the analysis of the crime scene. The “Sherlock Holmes” bot captures data related to crime scenes from sensory devices including cameras, microphones, electronic and alarm systems to perform analysis of the crime scene using machine learning algorithms. For instance, if a gunshot is captured by a microphone, the presence of highly reflective and large furniture will distort the recorded sound. This effect will be taken into account while determining the type of firearm used in the crime. The system will then, much like Mr. Holmes, be able to provide the identification of a weapon, a comprehensive crime scene analysis report (describing how all components in the crime scene may have affected the criminal activity), and a feedback report to designated recipients (like Inspector Lestrade). All this in-depth analysis will definitely make solving crimes “elementary” for law enforcement agents. Almost all of us have had frustrated pick-up experiences while booking a ride via an app. Sometimes, the driver just can’t seem to find our pick-up spot. Other times, especially when we are in crowded places like airports, with multitudes of cars in the vicinity, it becomes difficult to identify our cab without having to go and read every single license plate. Uber aims to solve this problem once and for all. According to a recently published patent application, the company has come up with an exciting new AR based feature to make it easier to find your ride. The patent application describes how when the driver reaches a pre-determined radius of your pick-up location, Uber will open a live feed using the camera of your smartphone. Then, based on the driver details — like vehicle make, model, color, and registration number — Uber will perform image recognition on the live feed, and determine when the driver is visible. Uber will then overlay AR elements onto the live feed to indicate whether an approaching vehicle is your cab or not, as shown in the figure above. Although technology is not groundbreaking, its application definitely has the makings of af feature that will be used by millions of users daily. Many people are uncomfortable using airplane lavatories. Although they look clean, there’s a sense of uncleanliness that you get as soon as you sit down to do your business. According to a recently published patent application, Boeing has come up with an ozone-disrupting UV light sanitizing system. The UV light sanitizing system will emit UV light onto surfaces that need sanitizing in the airplane lavatories, as shown in the figure above. However, as the UV light interacts with the air, ozone molecules are generated. Ozone, if inhaled, can cause health hazards like damage to lungs, and chest pain among others. Therefore, the new system also includes a fan assembly to generate an airflow between the UV light source and the surfaces where the UV light is emitted. This airflow disrupts the formation of ozone and keeps the amounts of ozone in the airplane to standards set by the Federal Aviation Administration (FAA). This simple invention can really improve the flying experience of millions of passengers, and it remains to be seen how soon this technology is adopted. Golf is an increasingly popular sport at amateur and professional levels, with almost 32 million players just in the US. Golfers spend a substantial amount of time developing a skill called “green reading” (or reading the course) as understanding the course plays a major part in the game. A recently published patent application shows Nike has come up with an innovative golf aid to help players in green reading. The golf aid includes a user-tracking system to locate a player on a golf course, a heads up display, and additional sensors like cameras to capture information on the player’s field of view. Once the system knows where the player is and what they see, it’ll provide distance measurements for all known elements of the course — like greens, sand pits, trees, and of course the hole. All this information will then be displayed to the user through the HUD, accompanied by distance lines, as shown in the figure above. Nobody likes flying, but Boening might’ve found a way to make it slightly better. The company has come up with a patent pending technology that replaces manual controls on airplanes with gesture-based controls, i.e. without touching/tapping a button or a screen (which may be far from a passenger’s reach). Gestures for controlling things are fun, may even give you a feeling of using magical powers to control things around you, just like Harry Potter. For example, you may make a gesture for turning a knob to control a fan speed of the air vent (as shown in the figure above). Further, you may make a gesture (e.g. swiping your hand up) in order to open (or close) a side window. This technology is sure to make flights more relaxing for millions of passengers — or at least slightly cooler. Look out for the latest lunar cycle-based patent update every full moon. Next up is the cute Pink Moon in late April. See you then!